With effect from the start of the 2013 cricket season, a scholarship prize covering the annual subscription of a young cricketer has been put in place. The scholarship is offered by Philip Jenkinson with a view to encouraging a "talented young cricketer" who has been spotted by the Club. 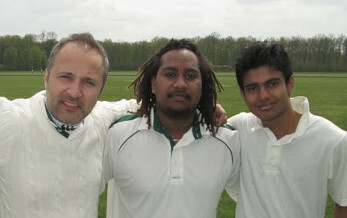 The beneficiary of this scholarship prize will be designated by the Officers of Lille Cricket Club. The Officers and Committee of Lille Cricket Club thank Philip Jenkinson for his generosity. For 2013, the scholar is Johnatan Lapacas, aged 23, a New Caledonian cricket international who arrived at the Club in September 2012 and who has come to mainland France to continue his studies in Tourcoing. Johnatan has already contributed to the series of wins in the last matches of last season.